This Broccoli Salad Recipe with Bacon was introduced by my friend a few years ago. 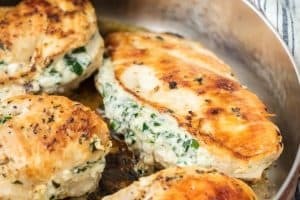 I love this recipe and have made it many times. Decided to make this recipe for dinner tonight! Super excited, I’m sure this will be amazing. Yes! I know you will agree that this can make a great dinner that fits according to your taste. 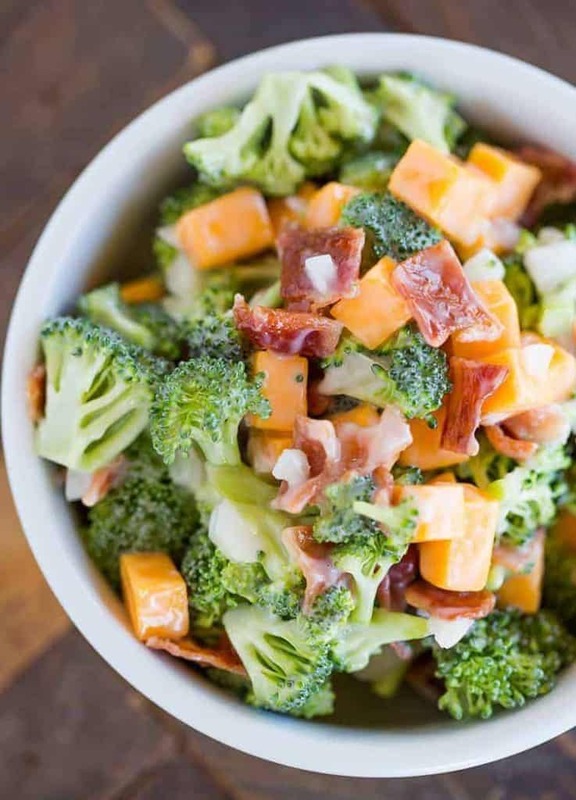 By the looks of this Broccoli Salad Recipe with Bacon, you can tell that it’s flavorful and delicious! I’m pretty sure you’ll admit that it’s mouthwatering. Do you agree? Obviously! No one can deny that this is such a classic and fantastic recipe. The advantage of this recipe is that it’s quick and easy to prepare. The four major ingredients you just need is broccoli, bacon, cheddar cheese, and onion. 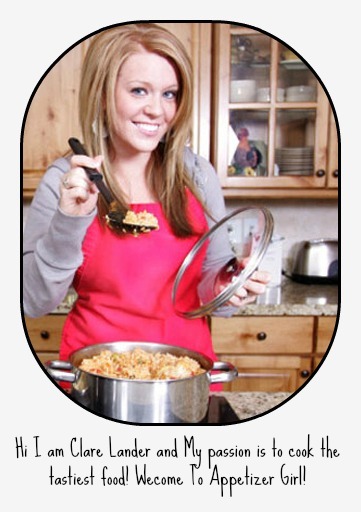 But you have an option what ingredients to use depending on what you have in the fridge. Some add lettuce and walnuts, well, it matters on which ingredients you like based on your personal preferences. In this recipe, I chopped the cheddar cheese into cubes. My friend used shredded cheese instead of cubes so its easier to get in a forkful with the other ingredients. Interesting! I will try that style next time. It’s time to make a dressing! The dressing that I make is a combination of mayonnaise, sugar, and vinegar. It gives the right amount of creamy, sweet and a tangy strong aftertaste. Such a perfect dressing. In making a dressing make sure that all the ingredients are evenly coated, but it’s not overpowering in the salad. I absolutely love it! You have your option to serve this salad immediately after making it, but, for me, I prefer to serve it cold. And the leftover is even better. 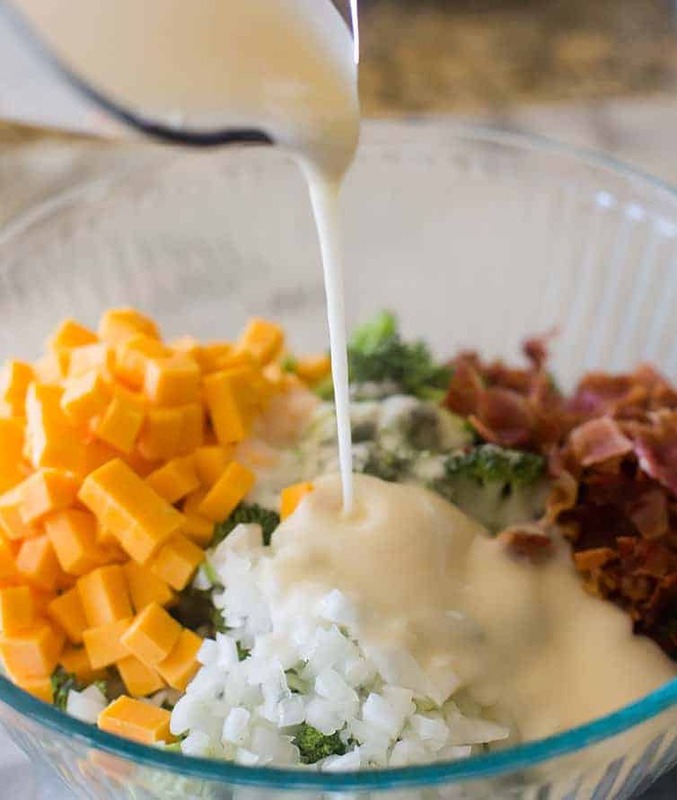 In a large bowl, combine the broccoli, bacon, cheese and onion. In a medium bowl, whisk together the mayonnaise, sugar and vinegar. Pour the dressing over the broccoli mixture and stir together until everything is evenly coated. 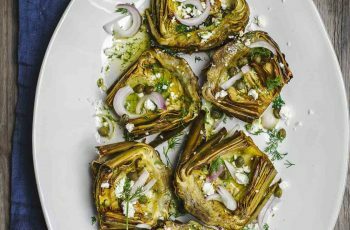 This salad can be served immediately, but tastes even better if you cover and refrigerate it for 1 to 2 hours before serving. 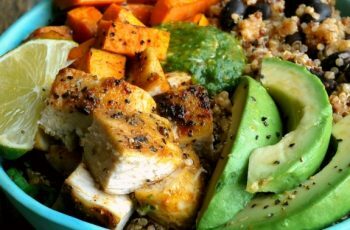 You can store the leftovers in an airtight container in the refrigerator for up to 2 days. You need about 7 cups of broccoli florets from the heads of broccoli, roughly 28 ounces. You can also use the bagged, prepped florets. Still need to cut up some of the larger ones, but it’s a big time saver! Use a yellow or red onion, whatever your preference. There are so many variations to broccoli salad, so feel free to add other ingredients based on your personal preferences: dried cranberries, raisins, sunflower seeds, chopped pecans, etc.